2.c: Adopt measures to ensure the proper functioning of food commodity markets and their derivatives and facilitate timely access to market information, including on food reserves, in order to help limit extreme food price volatility. GEOGLAM can also support other Targets (2.1, 2.4, 2.a, 2.3) and other Goals (12 and 13, with Indicators 12.3 and 13.3). GEOGLAM is a global initiative, initially launched by the Group of Twenty (G20) Agriculture Ministers in 2011 (Paris). The main objective was to “enhance the community’s capacity to produce and disseminate timely, accurate, reliable and actionable information on food production by improving the use of remote sensing tools for crop production projections and weather forecasting”. GEOGLAM is relying on Earth observations including satellite data at various spatial and temporal resolutions to monitor diverse croplands and rangelands. This collaborative initiative has at its core the “Coordination of Earth Observation (EO) Data,” working closely with CEOS (the Committee on Earth Observation Satellites) to access specific and relevant data for free from the world’s civil space agencies. Three main vehicles drive the initiative. #1 is “Timely & Accurate Consensus Reporting on Crop Conditions” – via the GEOGLAM Crop Monitors, which operationally provide monthly crop condition outlooks from multiple international partners, who use satellite, in-situ, and ancillary data to reach consensus about the world’s crops in major production areas (Crop Monitor for AMIS, “CM4AMIS”) and countries at risk of food insecurity (Crop Monitor for Early Warning, “CM4EW”). #2 is “Operational Research & Development”– via Joint Experiment for Crop Assessment and Management (JECAM) R&D site network and other research projects such as Asia-RiCE, EC SIGMA (Stimulating Innovation for Global Monitoring of Agriculture), ESA Sentinel-2 for Agriculture, and GEOGLAM RAPP (Rangeland and Pasture Productivity). #3 covers “Capacity Development” to enhance national and regional institutional capacity to provide timely production outlooks and early warnings of food shortages. Novel crowd-sourced information – e.g. land use, weather, and crop characterization, through GEO-WIKI and other platforms. For the GEOGLAM Crop Monitors, agricultural experts consult a novel visualization and analysis interface containing multiple EO-based datasets, which complements their own external analyses on crop conditions. During a follow-up conference call with Crop Monitor participants, these experts’ analyses are discussed to air any discrepancies and reach consensus before timely publication of qualitative condition outlooks. Crop Monitor for Early Warning: Crop Conditions in Africa and Yemen as of 28 January 2017. Areas which are in other-than-favourable conditions are shown with the affected crop. Improved (and earlier) outlooks on crop production: better information to ensure food volumes are well-anticipated and markets are well-calibrated for them. 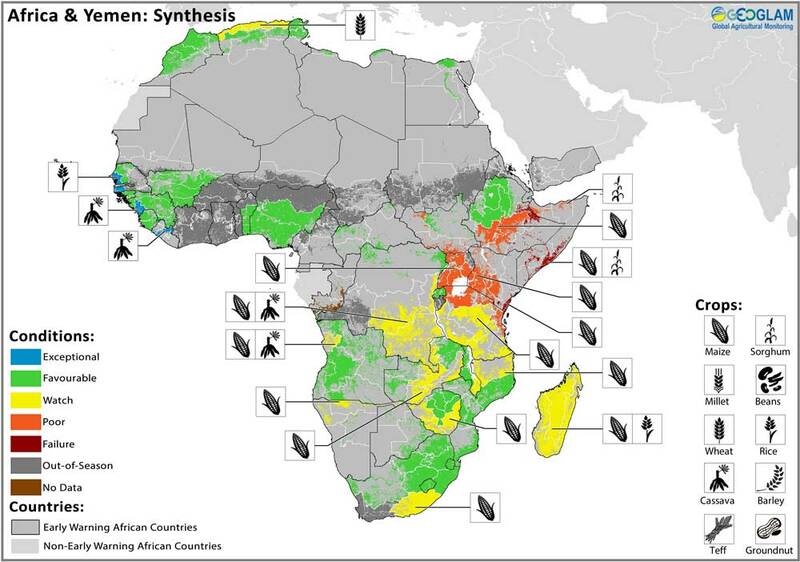 Improved early warning of food shortages: better adaptability to short and long-term changes. Enhanced capacity to assess inter-annual variability in cultivation practices and their impacts on productivity and the environment. Undertook inter-comparison of sustainable cropland management practices (impacts on productivity and local livelihoods). Developed international collaboration via transfer (esp. South-South) of knowledge and technology. GEOGLAM and the Crop Monitors are continually strengthened by increased participation from agencies and institutions. Both are further enhanced by improved baseline datasets as well as by improved quality of and access to Earth observations. The CEOS WG on GEOGLAM has influenced individual mission acquisition strategies (e.g. Landsat 8, Sentinel-1, Radarsat-2, etc.) and future mission planning (e.g. Global-V, Landsat 8) vis-à-vis science-based requirements. 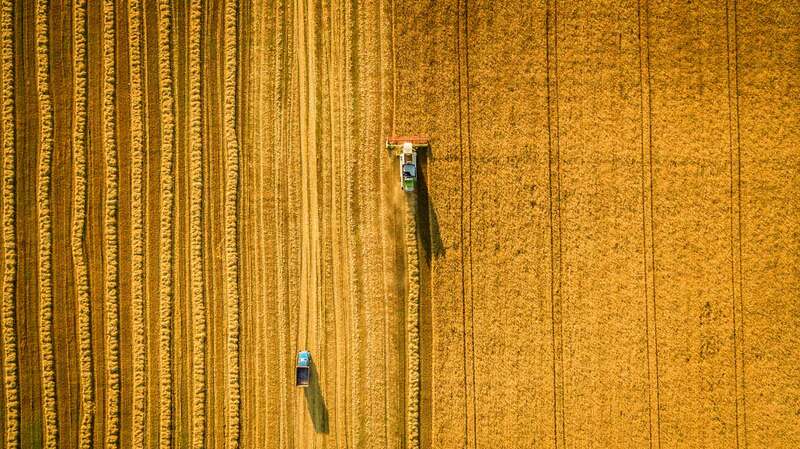 The users of the Crop Monitors – the Agricultural Market Information System (AMIS), the early warning community, agricultural ministries, members of industry, and others – have given regular positive feedback on the reports’ use and value for their food policy decisions and actions. GEOGLAM research and development activities underpin and strengthen the entire activity at every level – from national capacity to conduct monitoring to GEOGLAM’s efforts to create a “system of systems” that can accurately depict with regularity the status of global food production and supply. The project relies on active participation by and support from agricultural ministries across the globe, as key end-users of derived information. Users view GEOGLAM as innovative and valuable, and hope for its continued growth, as there is a crucial need for access to sustained and reliable, Earth observations. This requires coordinated acquisition, high quality pre-processing and validation of datasets, as well as user-friendly data dissemination systems.